The Saharan cheetah is one of the world's rarest big cats. At face value, that isn't all that surprising. Deserts are harsh environments that support few large herbivores, which means there are even fewer carnivores around. But if we've learned anything about ecology, it's that healthy ecosystems require the survival of apex predators; they keep everything balanced. Unfortunately, the Saharan cheetah (Acinonyx jubatus hecki) isn't doing so well; it's classified as critically endangered and perhaps as few as 250 individuals exist in the wild. "Virtually nothing is known about the subspecies," writes Zoological Society of London researcher and University College London graduate student Farid Belbachir today in the journal PLoS ONE. 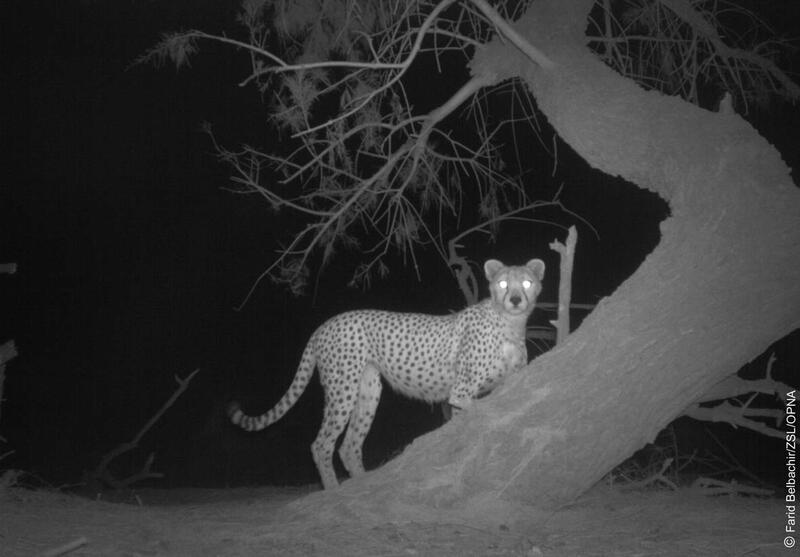 In an attempt to remedy this, Belbachir and his colleagues conducted two camera-trapping surveys over several months in a 2,551 square kilometre chunk of Ahaggar Cultural Park, located in south-central Algeria. In all they collected 32 photographic records of the rare cats. They discovered, perhaps unsurprisingly, that "the behaviour and ecology of the Saharan cheetah is severely constrained by the harsh desert environment." As a result, they lead largely nocturnal lives and require vast territories to find enough food to survive – meaning they occur in far lower densities than cheetahs that live on the African savannah. The researchers discovered that the Saharan cheetah is the most sparsely distributed of all the large African carnivores. They estimated that there is just one cheetah for every 2,000 to 10,000 square kilometre stretch of usable habitat. Because of this, the team would need to deploy at least 1,000 camera trap nights to get just a 95% chance of snapping a photo of a single cat (that's either 1,000 camera traps deployed on a single night, or one camera trap deployed on 1,000 consecutive nights, or two camera traps deployed on 500 nights, and so on). 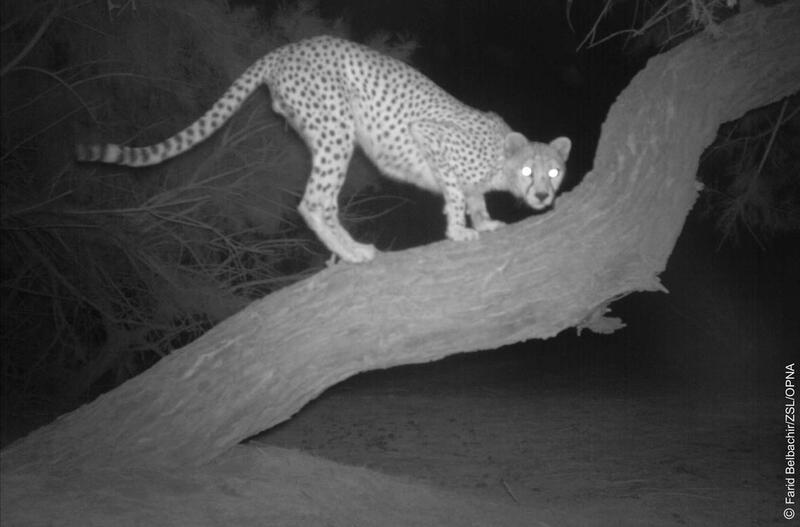 The survey efforts confirmed that Ahaggar Cultural Park is a critical area on which to focus Saharan cheetah conservation efforts. Two antelope species – the dama gazelle and the addax – have already been extirpated from the park, and two other ungulates (hoofed mammals) – dorcas gazelle and Barbary sheep – are hunted at night by humans, leaving little for the hungry cats. And still they persist, though at alarmingly low densities. The researchers call on their peers to conduct more surveys in the region to identify additional key cheetah conservation zones. In addition, they identify the Saharan cheetah as a potential 'flagship species', for which conservation efforts could help preserve large swaths of natural land. In fact, because the sub-species is so wide-ranging (owing to their territory needs) preserving the Saharan cheetah really could help to preserve entire ecosystems. 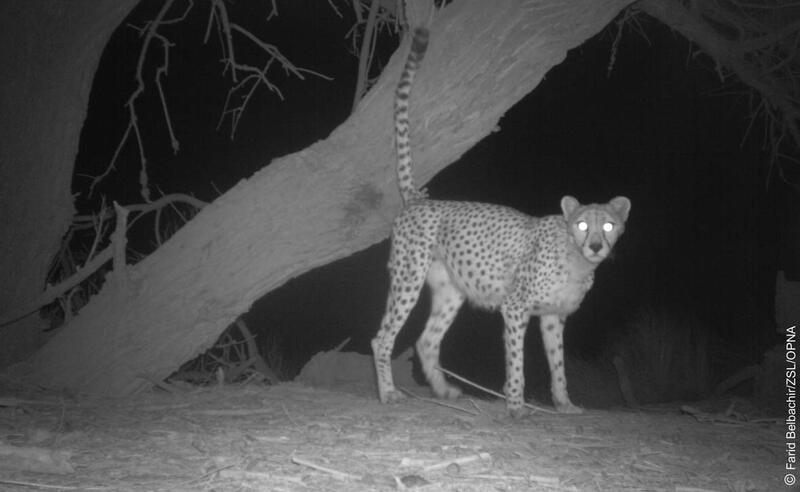 Belbachir explains: "Cheetah have a relatively large body mass and forward facing eyes, characteristics identified as predicting flagship appeal. Such flagship species [like mountain gorillas, golden snub-nosed monkeys and Komodo dragons] have been demonstrated to be effective at attracting global attention, and helping to secure resources necessary for their conservation." He also points out that charismatic flagship species help ensure that ecotourism programmes are sustainable rather than exploitative.